Houston Namadwaar’s second anniversary celebrations started off with its first ever 24-hour Prayer for Peace, where the Mahamantra was continuously chanted inside Namadwaar for 24 hours, from 9 AM on Friday March 9th to 9 AM on Saturday, March 10th. 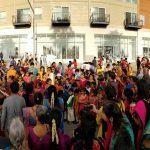 Several devotees from across the US had come down to Houston for the occasion and the 24 hours flashed by like 24 seconds as the Mahamantra was chanted with fervor and devotion. 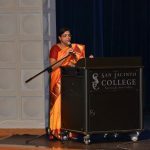 As a continuation of the anniversary program, on March 10 evening was the much awaited commemorative program that featured performances by popular Houston-area classical music and dance artistes and also a mass prayer by Sri Poornimaji. 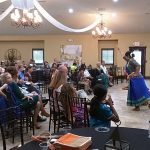 This commemorative program was attended by over 350 people, including members of several organizations and temples in the Houston area. The basis of Indian culture is to see divinity in everything—not only in every person, in nature, in places and in objects, but also in work, vocation and art. As a consequence, all Indian art-forms are simply depictions of the divine. As a testimony to this fact, a divine ambience was clearly obvious during Houston Namadwaar’s second anniversary commemorative program on March 10. Accomplished Houston artistes Vidushi Rajarajeshwary Bhat and Smt. Divyaa Unni fascinated the watching hundreds with truly divine music and movement, and Sri Poornimaji, disciple of His Holiness Sri Sri Muralidhara Swamiji, concluded the evening with a mass prayer that indeed manifested Divine presence in the arena. Organized by Global Organization for Divinity (G.O.D.) USA, the program, which was held in Sugar Land Auditorium, started off with a classical dance performance by Smt. Divyaa Unni and her students from the Sreepadam School of Arts. The brilliance and energy of Surya, the sun-god, was depicted beautifully in the first number. Next was a solo performance by Nita Joseph, a senior student of Divyaa Unni, showing the play between little Krishna and his mother Yashoda. Finally, Divyaa Unni herself gave a solo Kuchipudi performance, dancing excellently on the traditional tambalam (curved brass plate) while balancing a pot of water on her head, to another song on Lord Krishna. The Carnatic music concert by Vidushi Rajarajeshwary Bhat, accompanied by Vishaal Sapuram (chitravina), Poovalur Sriji (mridangam), and Keerthana and Kruthi Bhat (tambura), was out of the world; and each of the artistes clearly demonstrated their high caliber throughout the concert. 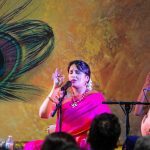 The highlights of the concert included a soul-touching piece in the first part seeking forgiveness of the Lord for any mistakes, and a stirring ragam-thanam-pallavi, aptly titled “Mohana Muralidhara Gopala”, where Vidushi Bhat’s creativity and versatility were plainly apparent, as were the skillfulness of young Vishaal Sapuram and veteran Poovalur Sriji. 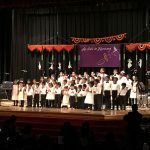 In a relatively short concert that lasted a little over an hour, the artistes beautifully presented all the important elements of a traditional Carnatic music concert. Smt. Bhat was also ably supported by her daughter Kruthi Bhat throughout the concert. Humanity and Divinity are inseparable. This being one of the tenets behind G.O.D.’s mission, several community projects as well as charitable-giving programs are conducted by G.O.D. throughout the year. As a special commemoration of Namadwaar’s anniversary, G.O.D. was honored this year to present a substantial donation of educational supplies to the Monarch School and the Westview School, both of which provide care and education to children with autism spectral disorders and other neurological differences. The chief guest for the evening was Mr. Andy Hoffman, Chief Operating Officer of Interfaith Ministries for Greater Houston. 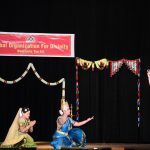 During his address, Mr. Hoffman applauded the diversity of cultures in Houston, and stressed the need for the mixing and appreciating of various faiths and cultures. Sri Poornimaji then addressed the gathering, explaining why a prayer house’s anniversary was being celebrated with dance and music – because the art-forms are also divine, as everything in the Indian way of life is designed to bring in remembrance of the Lord, just as chanting His Names is something that can be done at any time. At the end of the program, she again emphasized the importance of prayer and of the Divine Name—that the Lord is where His Name is chanted. This implies that prayers done with the Divine Name are extremely powerful. Exhorting everyone to chant the Mahamantra—Hare Rama Hare Rama Rama Rama Hare Hare, Hare Krishna Hare Krishna Krishna Krishna Hare Hare—every day, she said emphatically that sincere prayers with the Mahamantra will undoubtedly be granted by the compassionate Lord. A prayer was then made for universal harmony and brotherhood, and for peace within our community, in the state of Texas, in the USA, and in the entire world. The whole audience then sang the Mahamantra enthusiastically along with Sri Poornimaji, Vidushi Rajarajeshwary Bhat and all the other musicians on stage, thus concluding the program on a high, spiritual note. After the program, several people appreciated Sri Poornimaji’s short but strong talk that drove home the greatness of the Divine Name and the power of prayers. Many acknowledged the fact that the mass prayer was intense, divine and extremely moving. Some even admitted that the experience was indeed unexpectedly life-changing! 6 Responses to "Houston Namadwaar's Second Anniversary Celebrations"
Carolyn & I found the program very interesting but more so to me was the written material with references to Christianity, which implied that ultimately most of us worship the same God. I also noted a valuation of diversity with a condemnation of the rejection of diversity. I am reminded of a Methodist doctrine which states that each person must find his own way to God. The solo dancer was extremely graceful. Carolyn & I later commented on the many finger gestures she exhibited. There was probably a symbolism there which eluded us. Alas, with age my night vision has diminished. Where feasible, I avoid driving at night and especially if weather threatens to make driving more hazardous. Thank you for inviting us to this edifying experience. Words cannot express easily the happiness we have encountered yesterday at your second anniversary program. Each of the items were well coordinated and done with devotion. As Krishna said “Patram Pusham Phalam Toyam, Yo Mai Bhaktya Prayatchaye”, every thing was presented as an act of sacrifice to divinity. Please convey our thanks to each and every one of your team for including us in this action. Special thanks to Poornimaji. She spoke well very in the beginning and and set the stage to emphasize that everything about India is related to the “Supreme” – the music, the art, the food etc., I guess no other culture can boast it self of so eloquently about how intertwined things are in the life with God; we don’t realize it until we experience it. I am positive that your devotion and dedication will take you to higher levels of spiritual bless. When is the next kirtan chanting of mahamantra at the prayer house in Manvel? I met you yesterday with my friend, Sol, at the 2 year anniversary, and it was marvelous! Such a God-filled and inspiring event! Thank you for all the Seva for Houston! Look forward to attending the next chanting. I want to congratulate each one in the volunteering committee regarding yesterday’s event. It was well planned and coordinated event. We were privileged to see great talent in display and be part of 2nd anniversary celebrations of Houston Namadwaar. Thanks for inviting us for the event. Jai Gurunath! What an amazing team work. Wonderful to see our beloved master’s message moving world wide.